The pharmaceutical market is mainly dominated by small molecules in terms of numbers and total revenues. However, exciting times are coming for the global biologics industry, reflecting the success of biologics to treat major chronic diseases and certain kinds of cancer and autoimmune diseases. Historically, long approval period of biologics due to stringent manufacturing processes and regulatory pathways made the global biologics industry less attractive for investors. Biologics typically went through about five times as many in-process tests during development comparing to other pharmaceutical drugs. The situation changed in 2016, when biologics accounted for six out of eight best sold drugs . The Business Research Company expects that the revenues of the biologics industry to grow to $481 billion and its share of the gross world product is also expected to double by 2022. 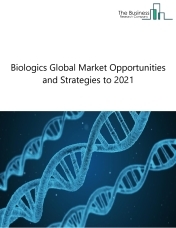 The biologics market consists of sales of biologics and related services by entities (organizations, sole traders and partnerships) that manufacture biologics to treat and prevent various microbial diseases and cancers. This industry includes establishments that manufacture products that are composed of sugars, proteins, nucleic acids, and combination of all these substances isolated from humans, animal and microorganisms or produced from biotechnology methods. The monoclonal antibodies (MABS) market consists of sales of monoclonal antibodies and related services by entities (organizations, sole traders and partnerships) that manufacture monoclonal antibodies used to enhance and suppress immune response in various medical conditions and to treat various diseases such as cancer, cardiovascular and cerebrovascular diseases. This industry includes establishments that manufacture anti-cancer monoclonal antibodies to prevent metastasis by reducing cell proliferation, immunological monoclonal anti-bodies, neuropharmacological monoclonal ant-bodies and others. The therapeutic proteins market consists of sales of therapeutic proteins and related services by entities (organizations, sole traders and partnerships) that manufacture therapeutic proteins used to treat various diseases. Therapeutic proteins provide important therapies for diseases, such as diabetes, cancer, infectious diseases, hemophilia, and anemia. The vaccines market consists of sales of therapeutic proteins and related services by entities (organizations, sole traders and partnerships) that manufacture vaccines to treat and prevent various diseases. This industry includes establishments that manufacture anti-infective vaccines, autoimmunity vaccines and vaccines for cancer and other diseases.